You can count on Chem-Dry of Acadiana to deep clean and renew the look of your stone or tile floors, countertops, showers, patios, foyers and other tiled surfaces. Our highly experienced technicians use a specialized cleaning solution and equipment to remove soil and dirt that has built up over the years. Stop spending hours on your hands and knees scrubbing and cleaning and allow us to renew the shine to your tile, stone and grout throughout your home or business. Like all other surfaces in our home, tile and grout are not immune to unhealthy elements that threaten your home, especially in areas like the bathroom and the kitchen. Over time, dirt and grime build up in the porous surfaces and can become an ideal breeding ground for disease-causing bacteria. Chem-Dry of Acadiana works hard to provide you with the service and expertise you deserve. With the help of our equipment and specialized cleaning formula that’s non-toxic and safe around kids and pets, you can rest assured that your tile and grout will be cleaner and stay that way for longer. Ditch the toothbrush and give us a call! We want to help you ease the back-breaking labor with an easier method. Did you know that your tile and grout can harbor harmful bacteria if not deep cleaned? As a part of every cleaning, your certified Chem-Dry of Acadiana professional will deep clean your tile and grout by uprooting stubborn dirt and grim from deep in the prorous surface. Then, the technician will apply a coat of durable sealant to your grout. When the sealant is applied, a barrier is created, minimizing the amount of dirt that is able to seep into the grout pores. This helps your grout stay cleaner, longer and maintenance is simple because dirt and other liquids don’t penetrate deep into the cracks. It is recommended that your tile, stone and grout be cleaned every 12-18 months. This helps to ensure your home or business long-lasting protection. Sparkling, clean, sanitized tile and stone looks better and is healthier for people and pets. Chem-Dry of Acadiana‘s service is perfect for many varieties and styles of tile and stone such as Saltillo, ceramic, porcelain, slate, granite and travertine. One worry that many homeowners have when having their homes cleaned is whether the products and process that the cleaner uses is even unhealthier than what they are removing. That is not a worry with Chem-Dry of Acadiana. All of the ingredients in our primary cleaner are safe and approved for your home and family, so you can know that your family is being well taken care of. 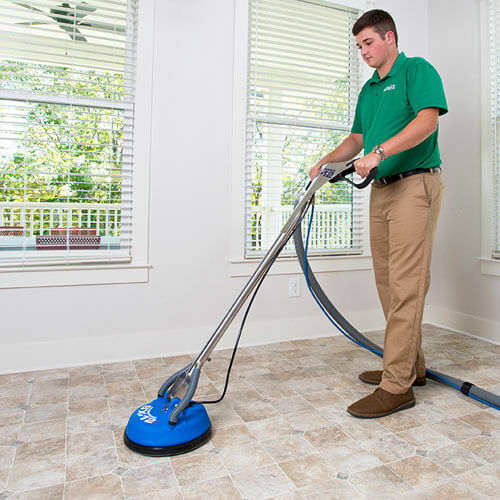 Get in touch with us today to learn more to to schedule your next tile cleaning in Lafayette, LA!